Two interesting new books have just arrived on our desk, in Steven B Stern’s “European Riverboats and Hotel Barges” and Douglas Ward’s “Berlitz Guide to River Cruising in Europe”, both hot off the presses. This week, we review and compare the two books for our readers. Elsewhere, MSC Cruises is offering special fares on a November cruise from Venice to Dubai in the MSC Orchestra, which also incidentally offers a way to get to Australia. Meanwhile, Costa reveals that it too is getting into outdoor promenades, with some details of its new flagship Costa Diadema. This week two books have arrived on our desk that deal exclusively with river cruising. The first, Steven Stern’s “European Riverboats and Hotel Barges” was published for the first time last year and is now in its second edition while Douglas Ward’s “Berlitz Guide to River Cruising in Europe” is in its first edition. Here is our comparison of the two. The companies themselves are covered differently in each book but it interesting to see Scenic Tours and Tauck Tours come tops in Steven Stern’s ratings while AMA Waterways takes the prize with Douglas Ward. While Stern dedicates 82 pages to describing the companies (including ratings for each vessel), Ward dedicates 142 pages to laying out his individual ship reviews, with each vessel getting a half page with ratings on hardware, accommodation, cuisine, service and other things. While Ward restricts himself to four pages of background on the operators, he does include some that are not covered by Stern (Abercrombie & Kent, APT, Noble Caledonia, etc). But Stern gives more information, from one paragraph to fifteen for each operator, as well as the strong points for each. 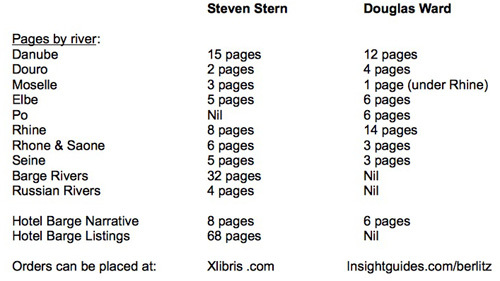 Stern’s book also includes some sample programs and menus, although not for each line. Somewhat astonishing in Stern’s book, at least to Europeans, is the fact that in the midst of Europe’s best vineyards Viking recommends American white and red wines, at least in the sample given. Uniworld make up for this somewhat by recommending an Italian red but still a South African white. In sum, both books have their strengths, and if I had to choose I might buy both. But if you are looking for a hotel barge holiday then the decision has to be go with Stern. He provides much useful information, including a page for each barge and ratings for each as well. If you want to know a little more about the riverboats then Ward provides more information per vessel at a half page each as opposed to two or three lines in Stern’s volume. If one subtracts the barge pages (8 for description, 68 for listings and 32 for rivers) from Stern’s work that leaves 173 pages for the river ships compared to Ward’s 255. Both books make an interesting and helpful read and each takes its own view. While Ward’s work might include a little more information on river cruising, Stern’s includes many useful illustrations, especially for hotel barges – although their reproduction is somewhat grainy. For those interested in getting to Dubai this winter, MSC Cruises has come up with a good November option that sails from Venice and arrives in Dubai in mid-December, well before Christmas. The 2,550-berth MSC Orchestra departs Venice on November 25 for an 18-night voyage via Bari, Piraeus, Heraklion, Rhodes, Aqaba, Salalah, Khor Fakkan and Dubai. Fares start at £1,199 per person in double occupancy for an inside cabin and £1,429 for an outside cabin, while balcony cabins start at £1,559 per person. Included in the fare are a free mealtime drinks package, three shore excursions and a 30% laundry discount. For those wanting to get to Australia by Christmas, this sailing might also be of interest, particularly as Emirates and Qantas both offer non-stop service from Dubai to Sydney, in 14 hours compared to the usual 24 hours from many UK and European countries. And if one wants to cruise to Australia, the same ship departs Dubai on February 21, sailing via Mumbai, Cochin, Colombo, Phuket, Langkawi, Singapore, Bali and Cairns to arrive at Brisbane March 15 and Sydney on March 17. This voyage takes 22 nights to Brisbane and 24 to Sydney (the full voyages to Fremantle is 33 days), and non-stop flights from London to Dubai take between seven and eight hours. South Africa is also on offer as the 1,756-berth MSC Opera departs Southampton on October 7 headed for Cape Town, a voyage of 21 nights via Amsterdam, Le Havre, Bilbao and Madeira. 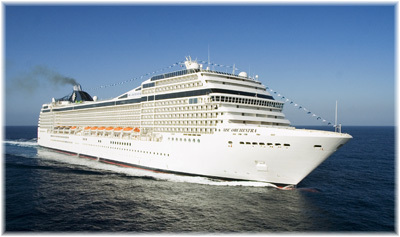 This voyage also features calls at Cape Verde and Namibia before reaching Cape Town. Outside cabins are available from £840 per person double occupancy but balconies are sold out. It all started with Norwegian Cruise Line and its Breakaway class ships, with their outside Waterfront on what used to be known as a promenade deck. The first ship of this class, Norwegian Breakaway, entered service to Bermuda in May 2013. More recently has followed news of MSC Cruises’ new “Seaside” class ships, which will feature extensive outside decks when they are delivered in 2017 and 2018. Cruise lines are finally getting it that passengers like to be connected to the sea and even Carnival Cruise Lines’ has been stressing its outside promenade decks on its newest ships. Now that the industry is opening up to the sea again, it seems as if Costa Cruises have been hiding something from us with their new flagship Costa Diadema, now being fitted out at Fincantieri’s Marghera Shipyard near Venice. The Diadema is in fact a “Dream” class ship and so features many of the same design updates as the new Carnival ships. 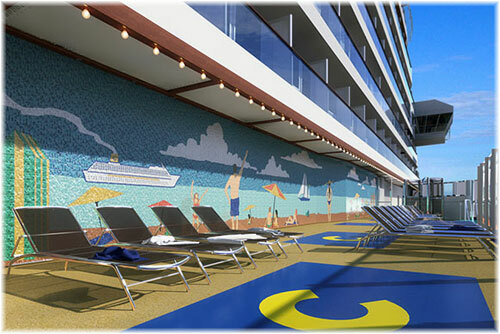 The longest promenade in the Costa fleet will provide a walk that has been designed to feel like a stroll on an attractive Italian waterfront, with imagery from the Italian coasts by Italian artists featuring on both sides of the ship and covering a total area of 440 square feet. The new ship’s promenade will measure 16 feet across and up to 26 feet where six cabanas and two Jacuzzis will be located. The cabanas and hot tubs extend out over the side of the ship, creating the sensation of being suspended over the sea. Guests will be able to relax in the cabanas over drinks as well as enjoy a sunset dinner sheltered away from the wind. 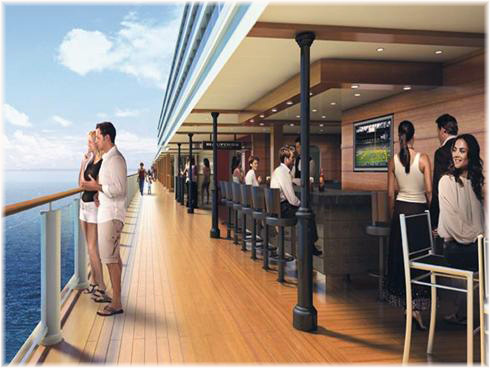 As with the other new ships for Norwegian and MSC, bars and restaurants will overlook the outdoor promenade. Guests will be able to order a glass of top-quality Italian wine at the Vinoteca while the Birreria will offer a selection of bottled beer from Italian and foreign brewers as well as beers on tap. And after a drink with a view of the sea, a stroll along the new flagship’s promenade will bring you to yet another elegant bar overlooking the stern. Beginning November 8 and into the summer of 2015, the Costa Diadema will sail from Savona on 7-night cruises to the western Med, including calls at Marseille, Barcelona, Palma de Mallorca, Naples and La Spezia. The Sunday Times this week published a review of Princess Cruises’ new Regal Princess. In the article, it mentioned that the ship has “only 342 inside cabins” – why does one get the impression that the journalist might actually have been having a dig at Princess? Might it be because the next page mentions the Aegean Odyssey, which carries only 378 passengers, or was that just one of those inconvenient juxtapositions?